It doesn’t matter what time of year you hear today’s jukebox classic, it still has the power to put you back into the long hot days of summertime when you used to go out first thing in the morning to hang with your friends and not return until food was up for offering at lunch and then dinner time. And as you got older, the song conjured the feeling of freedom felt on the even longer summer nights that made life living for. 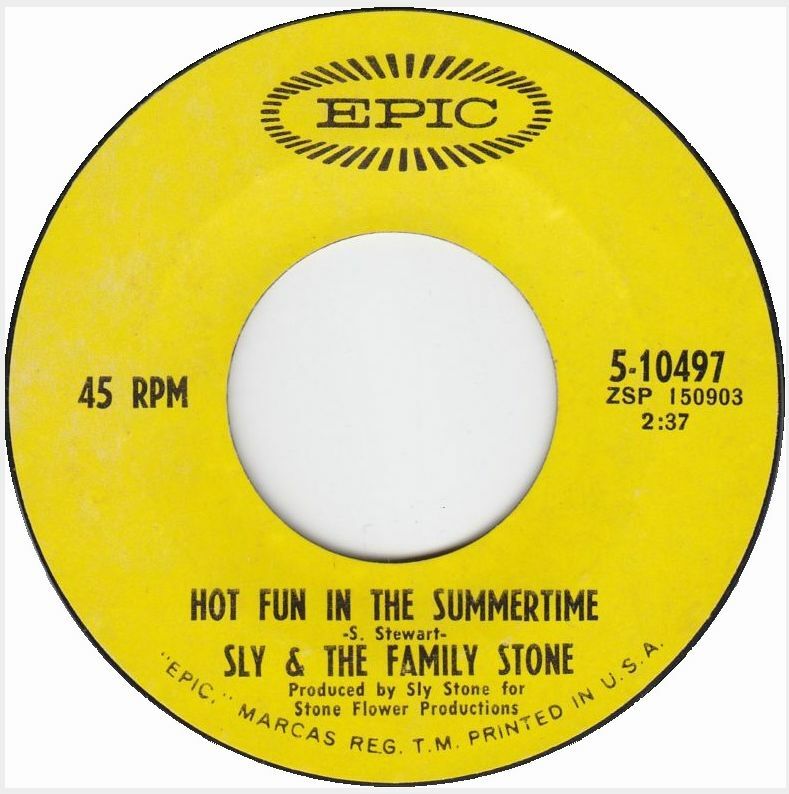 The piano introduction wouldn’t have been out of place on a 1950s doo wop recording and the pastoral string arrangement on this Sly & The Family Stone classic captures the heat and the wide open spaces of those hazy crazy days of summer innocence like no other song could. While it perfectly encapsulates that carefree summer feeling, there’s an undercurrent of melancholy that runs throughout the song. The simple explanation is hinted at in the lyrics “First of the fall and then she goes back / bye, bye, bye, bye there.” with the coming of the end of summer. However, many others thought the song was also a comment on race riots that were in the new headlines throughout the summer of ’69. The single’s release came hot on the heels of the group’s landmark performance at Woodstock resulting in it climbing to the #2 position on the pop charts and #3 on the soul charts in spite of Epic Records’ initial reluctance towards release a summer single at the end of August. 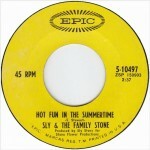 It was recorded along with “Everybody Is A Star” and “Thank You (Falettinme Be Mice Elf Agin)” for an in-progress album that was never completed in the wake of the demands put on Sly and the group in the wake of Woodstcok. As a result, the song debuted on the group’s 1970 Greatest Hits album which was Epic Records’ attempt to keep the band’s name in the marketplace while they were out on the road touring. The record ultimately sold over five millions copies (their biggest selling album) and climbed to the #2 position on the album charts. Sly Stone never got around to making stereo mixes for the three new songs on Greatest Hits and until the group’s catalog was remastered in the late 1990s, the songs never existed in true stereo. The personnel on the single consisted of Sly Stone on piano and vocals, Freddie Stone on guitar and vocals, Larry Graham on bass and vocals, Greg Errico on drums, Cynthia Robins on trumpet and Jerry Martini on tenor sax. The song was covered by The Beach Boys and Manhattan Transfer, and it provided inspiration to Phil Collins for his song “Misunderstanding” and the group Toto for their hit single “Hold The Line.” On the flip of today’s single is “Fun” which is the best track from the group’s third album Life, and also appears on the Greatest Hits album. 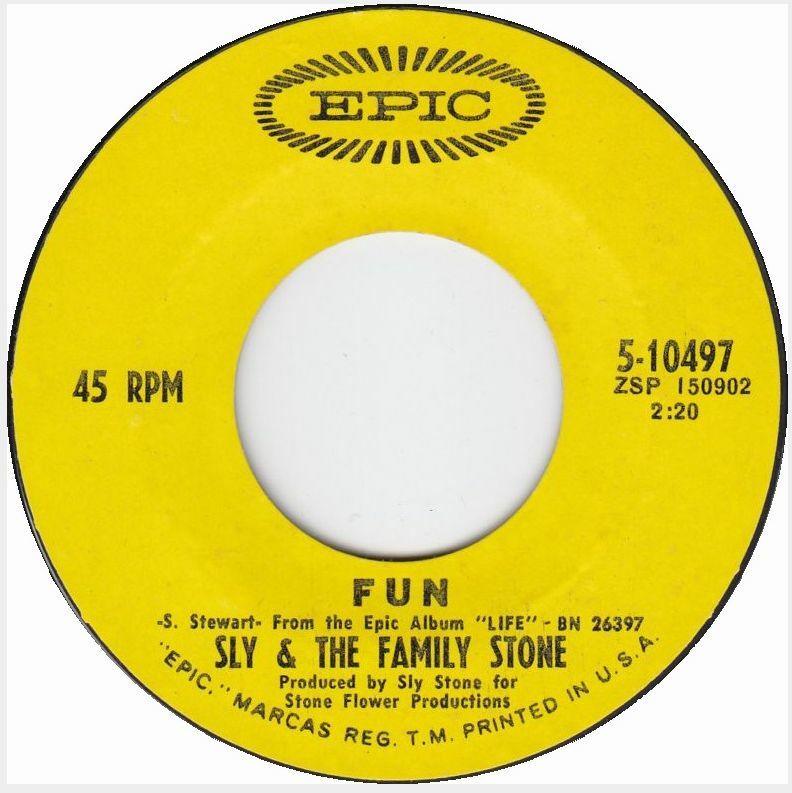 Sly & The Family Stone went on to follow the success of their Greatest Hits album with a record that focused on the bummer side of the era called There’s A Riot Going On. 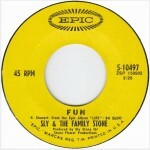 Several hit singles would follow including “Family Affair” and “If You Want Me To Stay,” but for all intents and purposes, the group’s run on the charts and in the public eye never burned as bright as in the summer of 1969.